Control iTunes without leaving what you're doing. Control iTunes -- Whether it's to pause the player, adjust the volume, skip a track or rate a song, you can do all that and more with simple customizable keystrokes. That's not all. 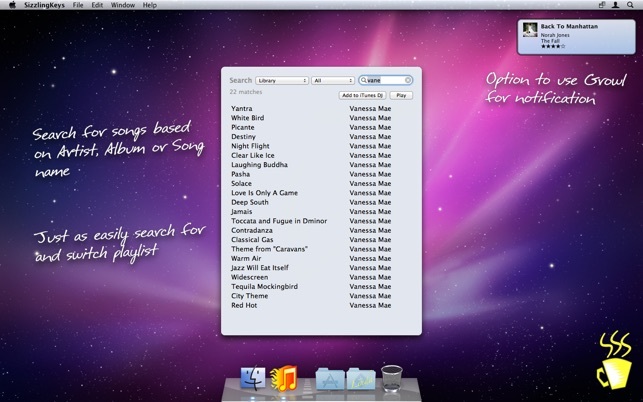 You can even search your iTunes Library or Playlists with a simple keystroke, all without switching to iTunes! See what's playing -- Why bring up iTunes just to see what's playing? SizzlingKeys features a floating window that shows you the current track info. Place it anywhere you wish on the screen by simply dragging it. Easy setup -- Having all the features you can imagine is useless if the app is difficult and confusing to use. That's why we make ease-of-use our top priority. Customizing SizzlingKeys cannot be easier. Extras -- SizzlingKeys is more than an iTunes controller. We figure since you are going to have a hot key app running in the background anyway, why not let it handle a few more functions? SizzlingKeys lets you optionally define hot keys for system functions like Sleep and Fast User Switching. There are many features to rave about in this app, but one stands out for people who need better search capabilities than most (perhaps all) of the other iTunes apps. SizzlingKeys allows you to search on a track name, album name, performer name, or composer. Typing a composer’s name in a general search like the other apps provide will result in an incomplete search. SizzlingKeys gives you the complete results. Just what I was looking for. This is a great utility. I think I’d go crazy if I had to go back to using iTunes like a caveman by clicking buttons in the interface. Sizzling Keys is a well-implemented way to contol many different aspects of iTunes music navigation. I just enabled the ratings hotkeys and am liking them as well. Thanks for a good little app! 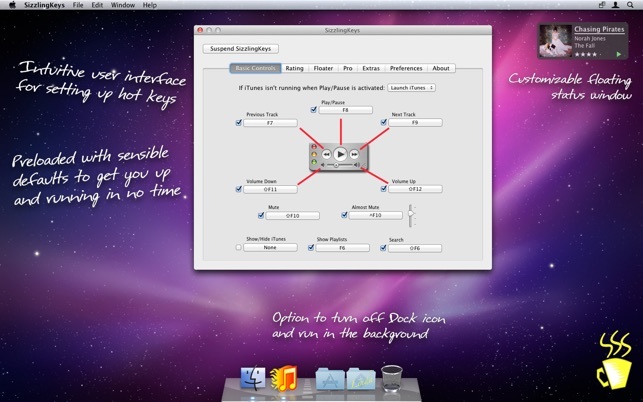 If you’re looking for a way to control iTunes while keeping it in the background, this is it. I listen to a lot of internet radio at work. In iTunes, I have a few folders, and several playlists with stations. SizzlingKeys makes it really easy to hit a hotkey, show all playlists, type a few characters to select one such as “SomaFM", and start playing. Also love being able to trigger a hover-over with song info, and lock the screen. Next/Prev track and play/pause is something many keyboards have keys for, but it’s nice to have a -consistent- key combo across the keyboards I use (laptop, home, work). Adjusting the iTunes volume via global hotkeys is something I didn’t expect to be useful, but now love. I -was- keeping the iTunes volume low and adjusting the system volume, but then any other app or system notification would of course be super-loud. Now I keep the system volume low and moderate the iTunes volume within that. Small irritant: If you have a playlist called “80s” inside of a folder called “80s”, the Playlist popup will simply list 80s twice in a row with no indication which is which. Or if you have a “Rock” playlist in an 80’s folder, there’s no indication it’s within that folder from the playlist popup, it just lists “80s” and “Rock” one after another. Easy remedy: rename playlist to “80s rock”, but the app could handle this use case more gracefully.